Want to brush up on the names and locations of the 48 contiguous states of the USA This program from the Family Games Web Center will help you. 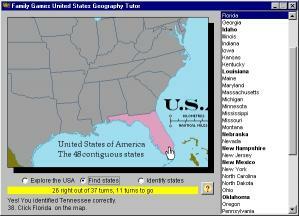 United States Geography Tutor presents a scrolling map of the U.S. along with a list of states. As your mouse pointer passes over the map the state under the pointer highlights along with its entry in the list. Simply browse the map until you feel ready then try either of the two self-test modes. In Find States mode you are asked to click a state on the map given its name. In Identify States mode you are asked to click the name in the list corresponding to the state that is highlighted on the map. 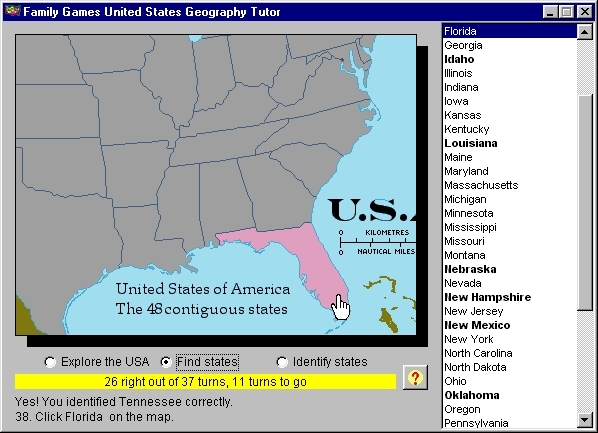 Both quizzes run through the entire list of 48 states in random order. A running score is displayed. Any errors are highlighted in the state list for later review.